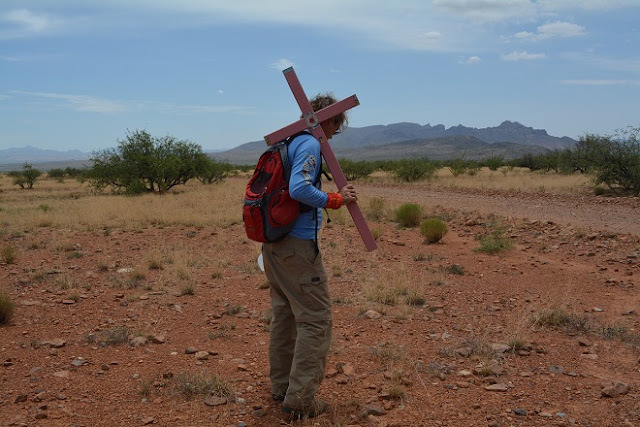 Planting crosses in the desert to mark dead migrants. We offered help but it was, "under control." He is a strong and strapping young lad! A Migrant Poem borrows from The Raven and was found tacked to a door inside the locker of a Samaritan group in Arizona. Beneath the poem was a picture taken of a migrant near death in July, 2016 ("Two weeks ago," I was told at the time.) I wanted to share this poem on this website to highlight the plight of those crossing the border and asked for the author's name.